My first experience with sketching while scuba diving was in 2012 in Roatan, Honduras. 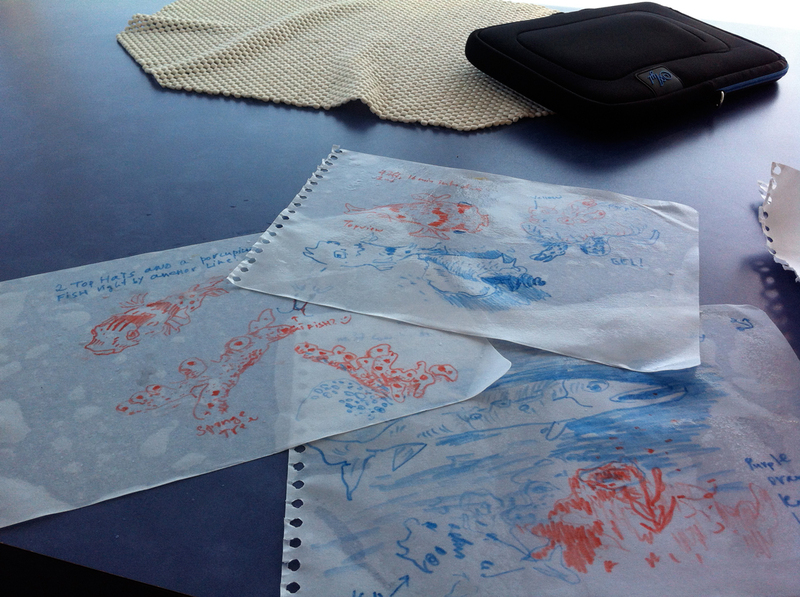 Here I am, sketching underwater! I cut in half a Rite in the Rain Polydura 8.5" x 11" sketchbook. Other equipment: a pocket on my belt, a regular #2 pencil, and a 4B carpenter's pencil. 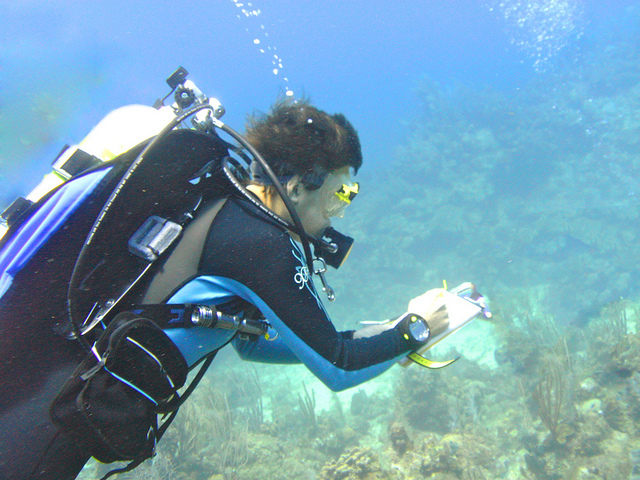 • Drawing required better buoyancy control and awareness of environment. I got better, but need more practice. • Spare pencils are handy. I broke one - not sure how. Seawater and depth make pencils fall apart quickly, not to mention runaway pencil ascents and pencils swimming away during boat boardings. • I attached a string to my pencil - it's still underwater somewhere, even though the pencil surfaced with me. • You can get really close to some subjects and they will stay still! Be careful - some might sting! • Many subjects are like kids - moving all the time. • Some pages were built gradually, adding bits and pieces to one page from different parts of the reef. • Carpenter's pencil was good for drawing motion - but too fat for details or notes. After each dive I would tear pages from my sketchbook, rinse them in fresh water, and lay them out to dry. Later I taped them in my main sketchbook and added additional notes. 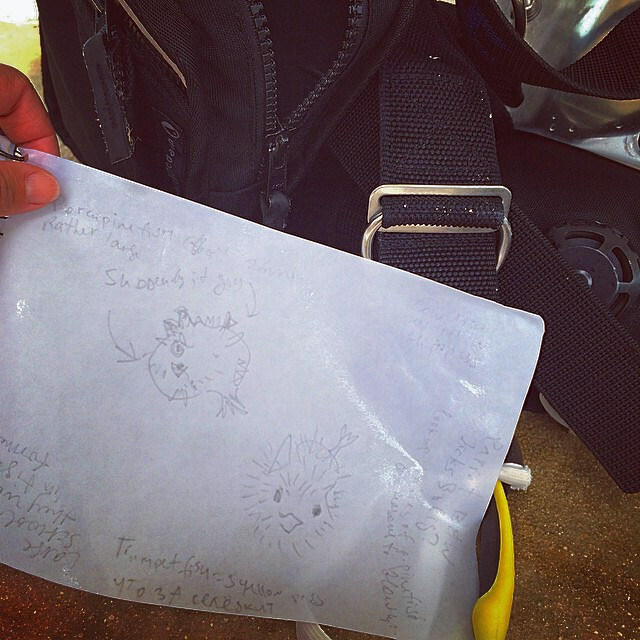 My second experience with scuba diving and sketching was in 2013. I spent seven days at sea diving from the boat on a trip from Saba to St Kitts in the Northeastern Caribbean. This time I had COLOR! 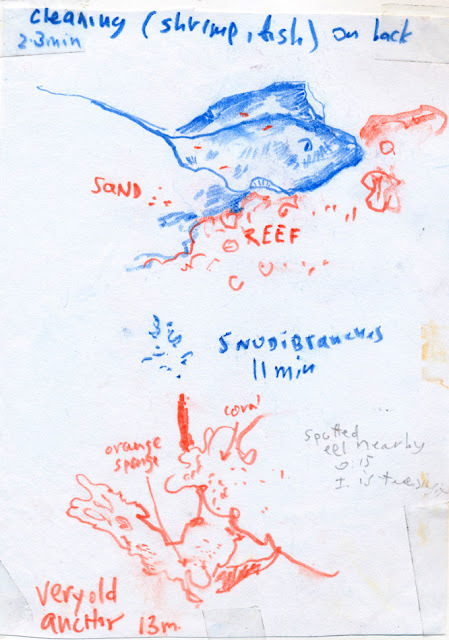 I used the same sketchbooks and #2 pencil, but I added a red-and-blue pencil. The softer lead was the most useful feature. No matter how soft the regular graphite pencil, it still feels very hard at depth. This spring I spent a week drawing underwater off the Caribbean island of Bonaire. I had a plastic, mechanical Aqua Pencil with me. Its thick lead and no metal parts made it a winner. It is as good as new after a week in saltwater! Another important thing is that the lead advances when you twist the back end of the pencil - and not push it. I threaded a piece of elastic band through the handle of the pencil and kept the other end on my wrist all the time - this helped a lot with the "I'm going to lose my pencil or will not have enough hands or attention to be safe under water" anxiety. 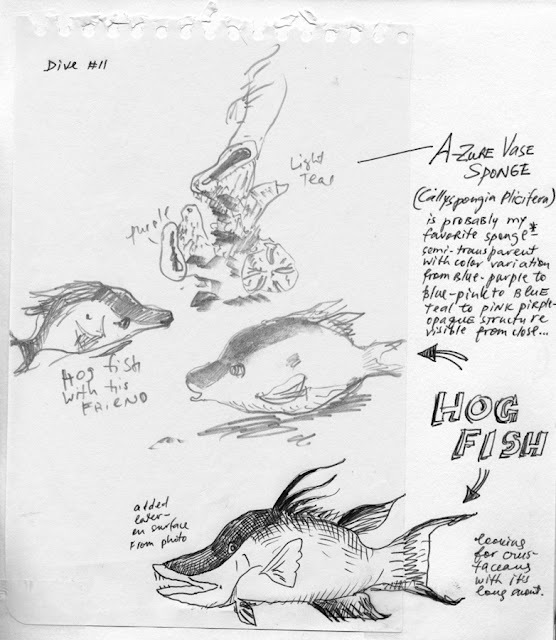 The highlight of the trip was seeing a porcupine fish do its signature trick of inflating its body by swallowing water, thereby becoming round. 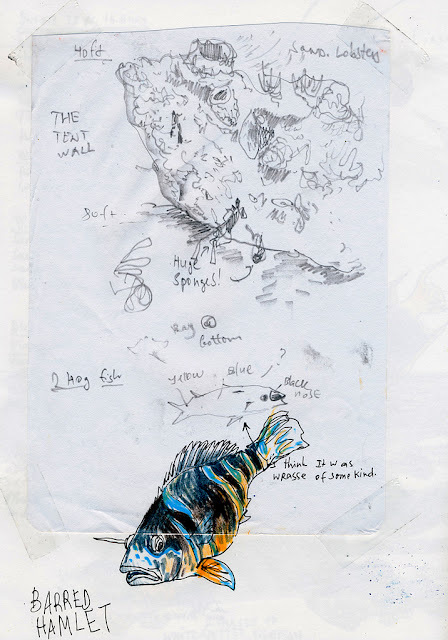 We were a bit far away from this event as it happened but I was able to sketch it as it takes a little while for the fish to go back to normal. 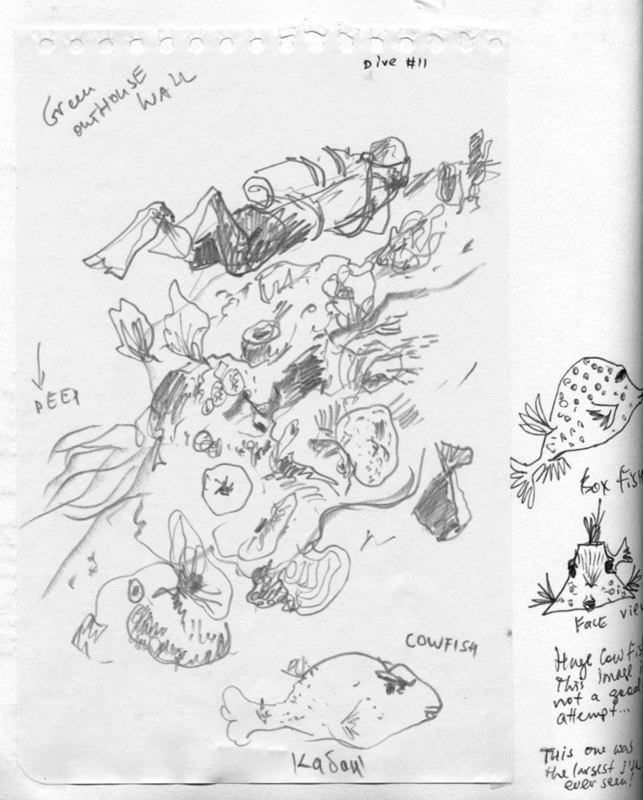 All in all, sketching underwater is A LOT OF FUN. Try it out, have a blast, and tell me about it! 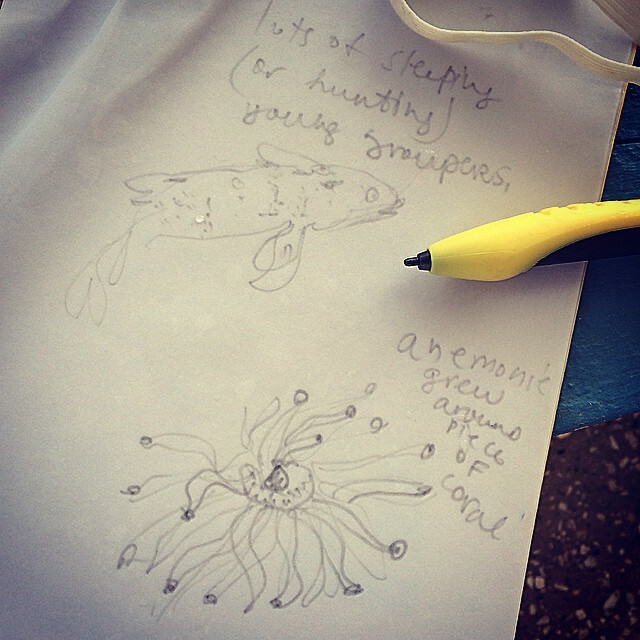 Nina Khashchina lives in Palo Alto, California and blogs her sketches here.